Are you so much eager to download and install Android 8.0 oreo on Redmi Note 4? Then, you landed at the right place. Today, we are going to instruct you how to Update Redmi Note 4 to Android Oreo in less than 20 minutes. As we all know, Redmi Note 4 is the mid-range smartphone launched in the year 2016 by Xiaomi India. The xiaomi Redmi Note 4 Runs on the Snapdragon 625 Chipset with Octa core processor. It has 5.5 inch 1080p LCD screen with Adreno 506 GPU. Also, The smartphone comes with 4GB of RAM and 64GB of Internal storage and expandable up to 128GB through external MicroSD card slot. The Rear Camera has 13MP, and the Front Camera has 5MP selfie shooter. The smartphone contains 4100mAh battery which is slightly a good thing for users. Redmi Note 4 has two different variants of RAM (3/4 RAM) and Internal Storage (32GB/64GB). The price starts from 10K INR to 13k INR based on the option you have chosen. So, without wasting our time. Let’s get started with the installation or updating guide. Before you update your Redmi Note 4 to Android 8.0. There are some safety precautions and requirements you should follow. Your Phone should have 65-80% battery. 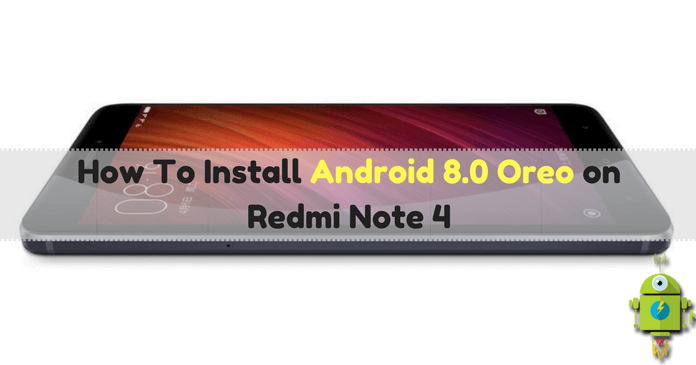 The below given Custom ROM is only for Redmi Note 4. Don’t use it on other devices. Your Phone should have at least 5GB of free space. Backup all your Files & Folders into the External drive or Cloud Storage. Your Phone should have installed TWRP Recovery to Continue the Installation process. Open the app, After the installation Process. You can able to see three different options (boot image /Recovery Image/ Zip File). Now, Tap on Recovery Image option. You will get five different recovery Option. Select Download TWRP Recovery and Wait for few minutes. Then, Tap on Yes To Install TWRP Custom Recovery. Download the Android 8.0 Oreo Custom ROM from Above given link. Now, Save it in External SD card. Now Turn OFF your device and Boot into TWRP Recovery Mode. After Entering into Recovery Mode. You can able to see many options. Now, choose the downloaded ROM update.zip from SD card. Now Reboot the Phone and Enjoy !! I hope you liked this tutorial on how to update Redmi Note 4 to Android 8.0 Oreo. If you know any other method. Please let us know in comment section. Also, Do share this article with your friends and relatives. Let them know with your sharing. If you have any doubt regarding installation. Leave a comment below. We will try to answer as soon as possible.